The CFVCSHF VoCALL Type B Outstations are designed to be versatile, compact and easy to use. 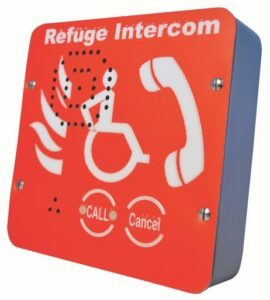 They are designed to fully comply with BS5839 for use as a fire telephone, disabled refuge call system or as a combined system. The outstation is available as both flush (via a separate bezel) or surface mounted with green, red or stainless steel finishes. All feature a high volume ringer, status LED and tactile braille signage providing a complimentary device to go with Type A Outstations, Master Network Handsets etc. in commercial buildings.